Professional and amateur actors can audition for a part in the musical production Fiddler on the Roof to be staged by Repertory Philippines. Repertory Philippines is holding auditions for its upcoming musical production of Fiddler on the Roof. Open to all professional and amateur actors, the auditions will be held on August 21 for the cattle call and August 22 for the final callback. The venue will be at the REP office at C2-A Building C, Karrivin Plaza, 2316 Pasong Tamo Extension, Makati City. Registration is at 6:30 p.m. Interested parties should bring their resumes and 2x2 photos, sing a song from Fiddler on the Roof and should be able to rehearse and perform weekdays and weekends. Rehearsals will begin first week of September and will have a regular run from November 9 to December 16, 2007. It will be directed by Rep’s President and Artistic Director Baby Barredo. 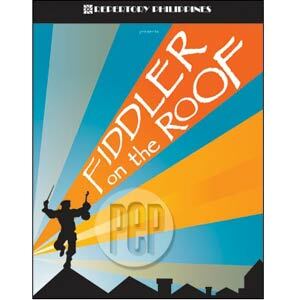 Fiddler on the Roof—with music by Jerry Bock, lyrics by Sheldon Harnick, and book by Joseph Stein—tells the story of a milkman whose task is to marry off his three daughters, which turns out to be more complicated than he had ever imagined! One of Broadway’s most famous musicals, Fiddler deals with holding on to one’s beliefs and tradition in the midst of a changing environment. Rich in historical and ethnic detail, Fiddler on the Roof has touched audiences around the world with its humor, warmth and honesty. It’s universal theme of tradition cuts across barriers of race, class, nationality and religion, leaving audiences crying tears of laughter, joy and sadness.